The Pharisees meant well—they truly did. And yet, they struggled against Christ at nearly every step. And while there were Pharisees, like Nicodemus, who sincerely desired to understand Jesus, he still publicly called them out over their practices and blind spots. The Pharisees separated themselves from disreputable people. Jesus intentionally sought them out. For the Pharisees, purity was about separating yourself from impure things like non kosher food and notorious people. When Jesus’ feet are being washed by the immodest women in Luke 7, Simon suggests that Jesus isn’t really a prophet. If he was, he wouldn’t let this unsavory woman near him. That’s not how Jesus worked. “Those who are well have no need of a physician, but those who are sick. I came not to call the righteous, but sinners.” The point was, we’re all sick. But the nice thing about those on the lower rung of the social ladder is that they don’t have to put on airs. They don’t have to keep up appearances. The Pharisees judged people by the company they kept. Jesus judged people by the individuals they ignored. The reputation that Jesus received for being a friend to tax gatherers and sinners was damning. Think about it as the equivalent of being considered a “n****r lover” in the pre-civil rights south. It’s a natural progression from the previous point. Sinners were human garbage, and not only were you condoning their lifestyle by befriending them, you were damaging your important reputation. Jesus judges people based on who they ignored. The poor. The motherless. The widow. The man lying bleeding on the side of the road. The person who couldn’t repay you for your kindness. In Christ’s economy, loving too frugally is infinitely more dangerous than loving too liberally. Let’s be honest, if the religious people around us aren’t clicking their tongues at some of our scandalous friends, we might be doing Christianity wrong. Pharisees prioritized the law over people. Jesus summed up the law in how you treat people. Remember how unglued the Pharisees came when they saw that Jesus healed a person on the Sabbath (Mark 3)? To the religious spirit, rules matter more than people. How did Jesus sum up God’s law? Love God with all your heart, soul, mind, and strength and love your neighbor as yourself. Bonus question: Who’s your neighbor? That’s right: everyone. When Pharisees saw a sinner, they saw a social issue. When Jesus saw a sinner, he saw a person of value. This is a big one. Religious spirits are quick to conceptualize problems into large issues and forget the stories of the people behind the sin. The Pharisees saw prostitutes not necessarily women. They saw a social ill ruining Jerusalem. Jesus was never trying to solve the prostitute problem. He was too busy trying to touch the lives of women who were prostitutes. Incidentally . . . that’s how you solve the prostitute problem. The Pharisees searched the Scriptures for life. Jesus expected the Scriptures to lead us to him. This happens too often when we elevate our interpretation of Scripture above the spiritual illumination which should enable us to be transformed into his image. The Pharisees did charitable acts and prayed publicly for attention. Jesus prayed in solitary places and asked miracle recipients to tell no one. The Pharisees turned their religious practice into performance. Guess who’s going to applaud you for parading your spirituality? That’s right, other religious people. Jesus is healing people and telling them, “Tell no one.” There’s definitely a strategy behind asking others to keep a lid on his miracles. But when you consider that Jesus went to secluded places to pray and refused the temptation to promote himself with his miracles, it’s obvious that there’s power in private, quiet acts of devotion and service. Jesus did them with correct motives and out of an overflow of relationship with God. The Pharisees expected homogeneous behavior from the faithful. They’ll look a certain way, behave in an expected fashion, and share the same convictions. That makes deciding who’s in and who’s out a cinch. As I stated in a previous post, the very fact that Jesus was willing to invite Matthew the tax gatherer and Levi the zealot into his tight-knit group means that Jesus didn’t expect uniformity out of people. On top of that, his larger collection of followers included people from every background—including some Pharisees. 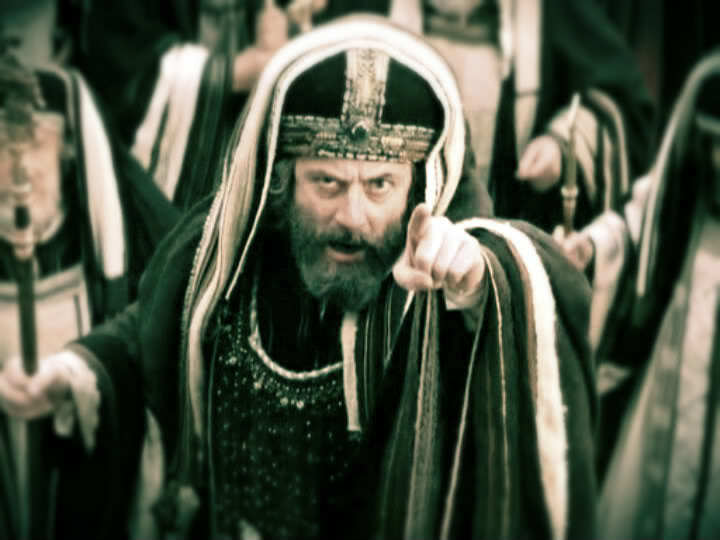 The Pharisees labeled people based on their behavior. Jesus named people based on their potential. Like a carpenter pointing out types of wood: birch, pine, oak, maple, Pharisees looked for simple labels to put on people: whore, alcoholic, thief, etc. Jesus never labeled people, he renamed them based on the potential he saw in them. He changes Cephas into Peter (the rock), not because of Peter’s regular, solid behavior, but because he saw Peter’s steadfast potential. In fact, recognizing and naming someone’s potential is probably the most powerful thing you can do to empower them. Most people know where their weaknesses lie. They don’t need to be beat up with them; they need people who can recognize and call out their strengths. Pharisees attributed behavior they couldn’t understand to Satan. Jesus suggested that wisdom was vindicated by an action’s outcome. The Pharisees didn’t understand why John the Baptist was so severe and such an ascetic so they decided that he must have a demon. They didn’t understand how Jesus was healing people so they decided he must be doing it by the power of Satan. When you feel the need to make immediate judgments, you’re inevitably going to make a wrong one. Jesus says that the outcome reveals the wisdom in an action. Sometimes it’s worth waiting to pass judgement because things aren’t always as they appear. The Pharisees were willing to kill to protect their culture. Jesus was willing to die to inaugurate his. Christianity isn’t about what you’re willing to do to maintain the status quo; it’s about what you’re willing to sacrifice to see the kingdom realized. Jesus’ message was to love and pray for our enemies—to turn the other cheek and be a peacemaker. In the end, it’s Christ’s example that’s going to assist in God’s plan to redeem the world to himself. I received a tweet telling me that “a friend of a friend was writing a response to your Pharisee post.” My initial response was, “Well, I probably won’t read it.” I mean, a response blog is not going to be positive and is probably going to be entitled, Open Letter to the Dummy: Jayson D. Bradley. My curiosity got the best of me and I read James Prather’s post Reclaiming the Reputation of the Pharisees, and I really liked it. It was intelligent, thoughtfully presented, and (most importantly) kind. So, if you’re interested in an academic and positive look at the Pharisee’s influence, you should check it out. James: I understand how you walked away from this post with the frustration you had, but it wasn’t my intention. There is nothing in me that desires to make the Pharisees into villains. I think that the weaknesses of the Pharisees are many of the same weaknesses you find in people of every faith. They were struggling to be obedient in a trying time. And in many ways, if it wasn’t for the Pharisees, Judaism may not have survived Rome. My #1 point in this post was to talk about the Pharisees weaknesses (as I see them) and hold them up as a mirror to some of those who, because of their desire to be obedient may be out of step with Christ. I appreciated your tone more than you know. I suppose that’s why, despite being Christian, I feel so much kinship with certain atheists and agnostics. Because they preach a message of tolerance, hope, and human potential in a way that many actual Christian authorities seem to forget is part of the Gospel (John 13:34). If this had been a book; words printed on paper and bound in my hands, there would have been lots of underlining. This is great stuff, Jayson. I think my mom was a Pharisee, way back during my formative years. And my dad…..he was a pastor (still is) but left the family after an affair erupted and he was asked to leave the church. I grew up thinking God expected me to have my external behavior modified, and as a born authority challenger that didn’t go over well. As well as assuming from traumatic family implosions and separations that God would leave (like my dad). It was, in my little girl mind, a lose-lose. So, f#&% you. I’m out. Since returning Home there has been much to hash out and unlearn. A long and arduous process I am grateful to be living out (except for the days that have really sucked. Okay. Those too.) I want to love well. I don’t really give a crap about who’s supposed to be “in” or “out” by someone’s definition or denomination or list of rules. I have been loved well and when the rubber meets the road that’s all I want from the days I have left on this planet….to love well, my wiccan friend, my agnostic friend, my non-Christian husband. Every last one of them. And the greatest of these is love. A great post on the heart of Jesus vs what ‘religious’ people believe. For various reasons, including my job as a romance novelist, my dreadlocks, my pagan friends, I get judged. It used to bother me more, until I realized that Jesus was judged for the same reasons. Thanks for this post, really enjoyed it. So very true. So very different from Evangelical culture. Thanks for your post, I very much appreciate the overall point of it, and am sympathetic to your goals. But I’d like to add my agreement with Prather’s rebuttal, that your portrayal of Pharisees is historically way off. Why don’t Christians know about this? Because there has been a two-thousand year tradition of painting the Pharisees as black as possible, so that Jesus would seem brilliant in contrast. Because of this habit, his Jewish context has been largely disdained and ignored. It’s only been since the Holocaust that Christian scholars have started realizing how wrong-headed this is, after seeing how much it has contributed to Antisemitism that has been murderous, at times. Thanks for your comment, Lois. I greatly appreciate it. The last thing in the world that I would ever want is to contribute to antisemitism.